Throughout our house, we have quite a few skulls - two-dimensional, three-dimensional, sculpted, painted, and drawn. My husband and I both like them, and we both seem to have our own little collections that we've added to over the years. When we were on our honeymoon in New Mexico, we were in awe of the amazing skulls and the wonderful Day of the Dead (El Día de los Muertos, as it is also commonly known) dioramas at the Museum of International Folk Art in Santa Fe. Wow - what a collection! Needless to say, we came home with a fun variety of skulls after that trip, including many that were made for celebrating the Day of the Dead. These skulls often make their way into my work and my dreams. This piece is based on a dream I had not too long ago of all the skulls around me. The skull often acts as a symbol for me, reminding me of how lucky I am to have the life I have. This is one of my favorite! 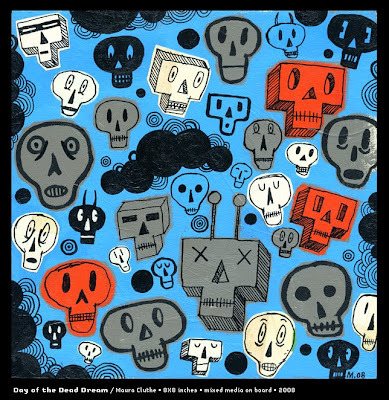 I love skulls as well as other Mexican folk arts! Oooo Maurina . . . I LOVE this one. Big surprise I know.